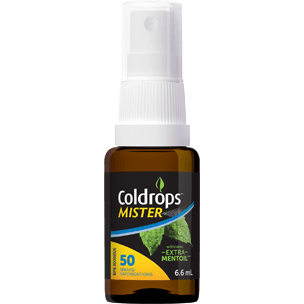 Coldrops® Mister is formulated with extra Mentoil®: A unique concentrated blend of menthol and fractionated coconut oil that provides cold symptom relief in just one spray. Menthol is the active ingredient in Mentoil® and is naturally sourced from Mentha arvensis, commonly known as wild mint. This is what causes mint to be "minty" and makes your body feel cool, providing a soothing relief. To read more, visit Why natural cold relief. Each spray contains 18.3 mg of menthol. 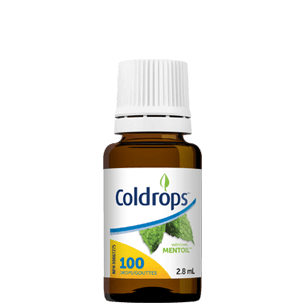 The menthol in Coldrops® Mister is naturally sourced from Mentha arvensis leaf. Coldrops® Mister is certified non-GMO. Fractionated coconut oil with no other chemicals or additives. This makes Coldrops® Mister free from sugar, artificial preservatives, artificial sweeteners, and most common allergens. No mess, no measuring, no fuss. Coldrops® Mister features a MicroMega MisterTM dispensing technology. This allows one single spray of Coldrops® Mister to be accurately dispensed, which can be administered directly into the mouth. Coldrops® Mister can be easily taken with you wherever you go. Step 1 Adults - Simply take and hold one spray in the mouth for a few minutes. Step 2 Coldrops® Mister is designed to be dispensed directly in the mouth. Step 3 Once the spray is dispensed, store the bottle between 5°C and 30°C. Repeat every 2 hours as required. Please always read and follow the label before use. Click here to read more details.